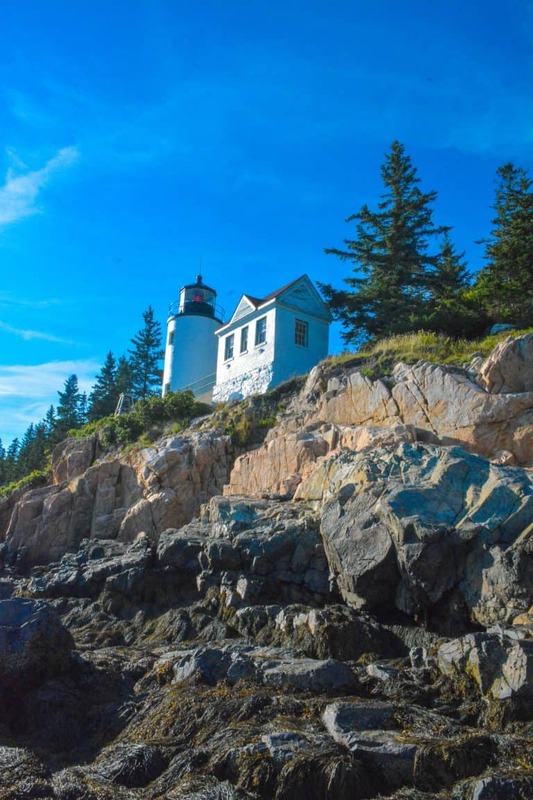 Visiting New England’s Acadia National Park is an annual summertime tradition for many families from Massachusetts, New Hampshire, and Maine. However, visitors from all over the world also come to enjoy this national park in Maine. In recent years more than 3 million people have visited the park each year! Families love hiking along one of the most scenic stretches of Atlantic Coast. 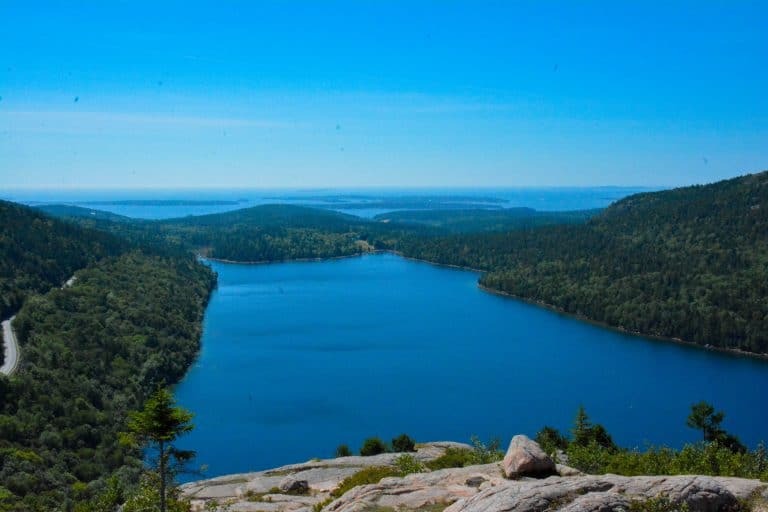 Acadia National Park is a place to trade the business of urban New England and the sticky humid heat of the cities for endless forested bike paths, rocky trails to coastal mountain peaks, and lakeside outdoor picnics. On a clear day, Cadillac Mountain is the gem of Mount Desert Island. 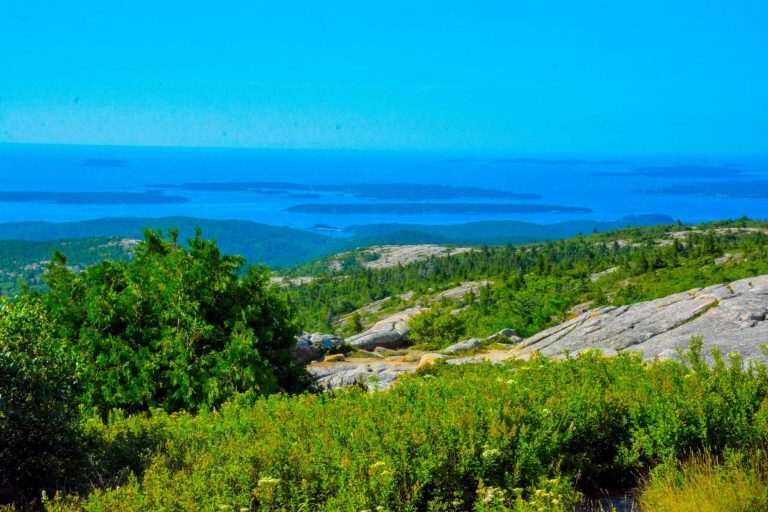 The expansive view from the summit tops the list of things families will want to experience when they drive up the coast of Maine to Acadia National Park. The sweeping view of deep blue ocean water dotted by islands is partly why Acadia National Park in Maine was the first national park formed east of the Mississippi River. It’s possible for families to hike or drive up to the summit. At 1,530 feet, it’s the tallest mountain on Mount Desert Island. 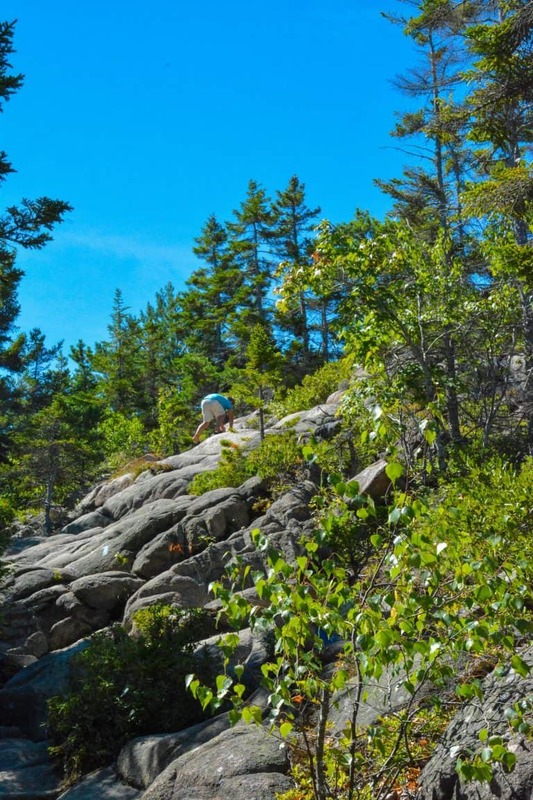 However, with so many other fabulous hikes nearby, most families simply make the 15-20 minute drive from Bar Harbor to the parking lot at the top of the mountain. The views from the top are especially popular at sunrise and sunset. Just steps from the parking lot, kids can jump from rock to rock or walk a gravel trail around the top to admire the views. Being from California, the iconic 27-mile Park Loop Road in Acadia National Park beginning in Bar Harbor reminds me of California’s famous 17-Mile Drive. Both these scenic drives feature miles of rocky shoreline virtually unparalleled along their respective coastlines. Also, both drives have plenty of parking areas for tourists to get out of their cars, soak in the salty sea air, and watch the gulls fly overhead as the waves crash below onto sharp cliffs. Acadia has its monstrous blowhole, Thunder Hole, while the 17-Mile Drive has its signature Lone Cypress tree. Each drive has a couple of sandy beaches to enjoy on the rare sunny day, but the water remains frigidly cold even on the hottest day of the year. Acadia’s Park Loop is the defining Atlantic coastal drive in the United States. 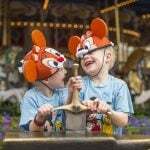 It is more than worth a family’s time, whether they visit on a peak weekend in August or a stormy day in June. As beautiful and tropic as the bright blue waters of Sand Beach might appear in a photograph, its water remains remarkably cool even on the warmest summer days. Toddlers might find the sand fun to play in, but after feeling a splash of salty seawater, they won’t be tempted to wade out further. Still, on sunny days, the large, tiered parking lot, the first along the Park Loop Road, tends to fill by 11AM. This beach is close to Bar Harbor, and it is one of the only sandy ocean beaches within miles. What is a summer vacation without a trip to the beach? Four Acadia National Park hiking trails originate near Sand Beach just outside of Bar Harbor. The classic Ocean Path, which runs parallel to the Park Loop Road from the top tier of the Sand Beach parking lot past Thunder Hole to Otter Point, is a relatively flat trail with plenty of opportunities to climb out onto the rocks overlooking the ocean. A trailhead for the Great Head Trail is found on the opposite side of Sand Beach. This Acadia National Park hiking trail loop goes up large rocky cliffs overlooking the beach and includes some rock scrambling. It was just the perfect amount of climbing for my adventurous 6-year-old boy. Across the road from Sand Beach is the much more strenuous Beehive Trail, known for its iron rungs and more challenging rock scrambles. After seeing some pictures of it, my thrill-seeking boy has already made me promise that I’ll take him on the Beehive Trail on our next opportunity to go hiking in Acadia National Park. This trail is certainly not for those with a fear of heights. Finally, the Gorham Mountain Trail can be reached just past Sand Beach on the Park Loop Road. It is a more moderate Acadia National Park hiking trail appropriate for families while still affording the same gorgeous views of this most beautiful area of Acadia National Park. Families spending more than a couple of days in Acadia National Park hiking and biking will likely need a bit of a rest after a few days. The perfect way to give your tired feet a rest is to take a boat ride. Several different types of boat rides are available from Mount Desert Island. Visitors can hop on a small ferry boat that goes to one of the more remote islands near Mount Desert Island like the Cranberry Isles or Baker Island. Even in peak season, these quiet islands are bound to provide solitude and peace. Another option is to take a lobster boat tour or a wildlife boat tour out of Bar Harbor. 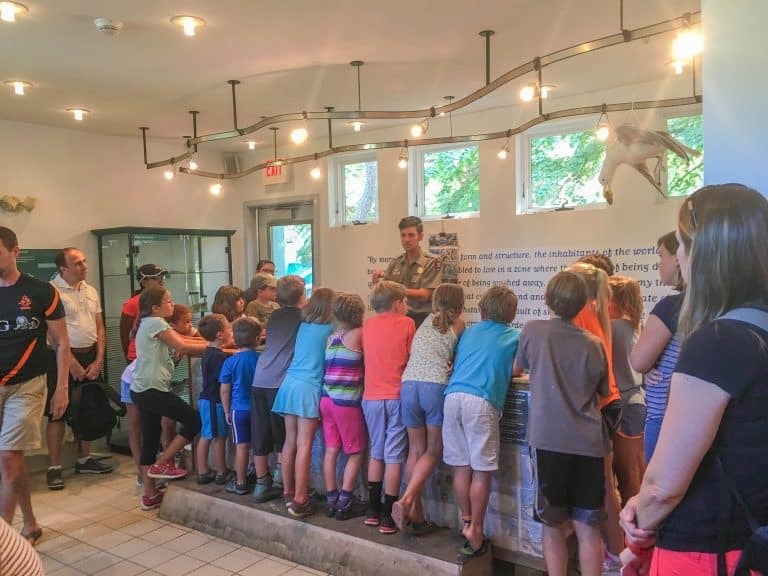 Tours discuss the seafood industry in Maine, bring up a lobster or two from the traps, pass by local gray seals and harbor seals, and watch for bald eagles. There’s something for everyone in the family at Jordan Pond in Acadia National Park. The Jordan Pond House serves tea as well as full meals both indoors and outdoors within view of the scenic lake. 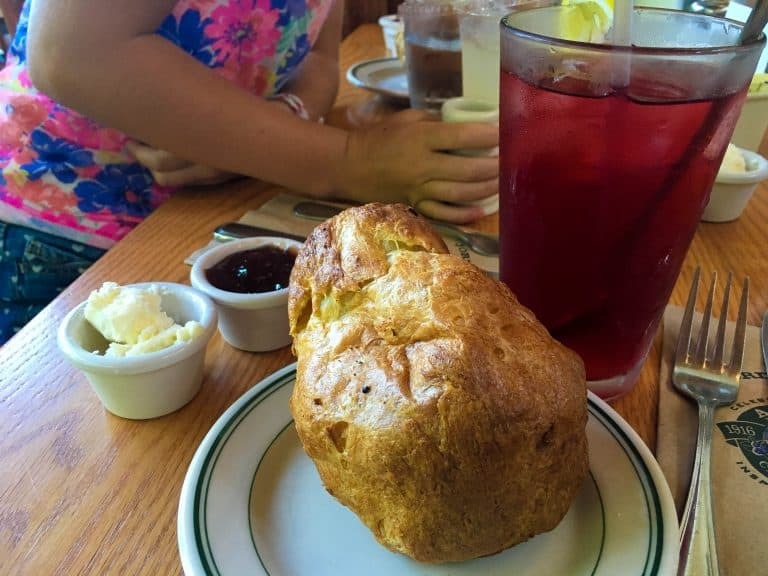 The popovers at the restaurant are legendary. 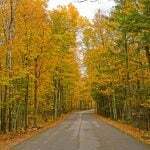 They date back over 120 years before the establishment of the park as Sieur De Monts National Monument in 1916 by Woodrow Wilson, and the building of the parks historic carriage roads in early 20th Century by the Rockefeller family. Portions of the trail around the lake are flat and laid in gravel. 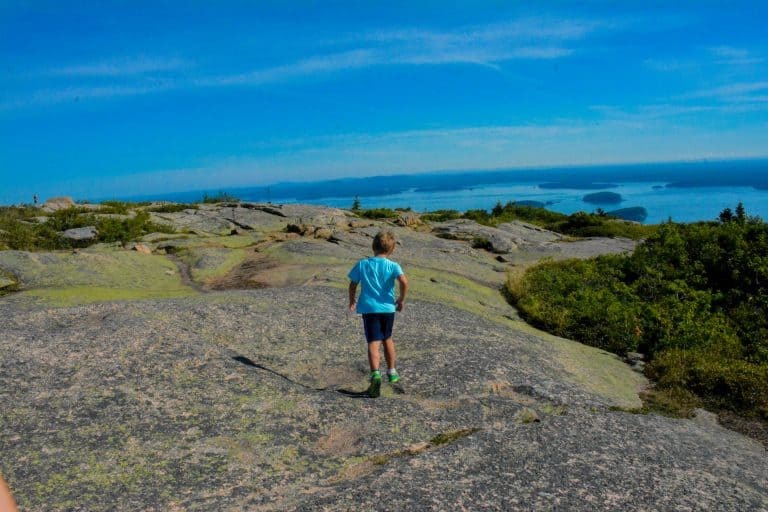 Even littlest ones can join the family on a stroll beside the lake on this Acadia National Park hiking trail. 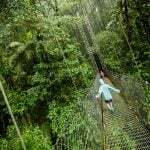 There are also options to climb upwards to Bubble Rock and some of the adjacent mountains for the more adventurous members of the family. 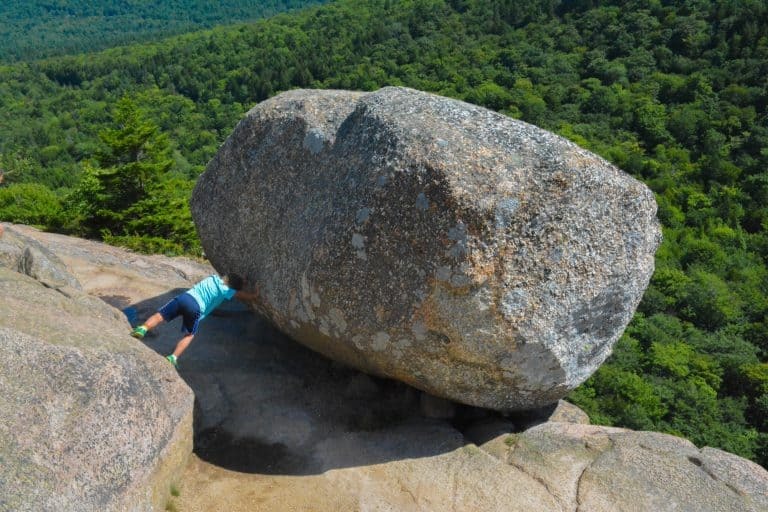 While hiking up from Jordan Pond to South Bubble Rock might be a bit strenuous for the children in the family, there is a small parking area just up the road that offers access to a more kid-friendly trail up to this fun rock formation and viewpoint. It is one of the best Acadia National Park hiking trails for families. 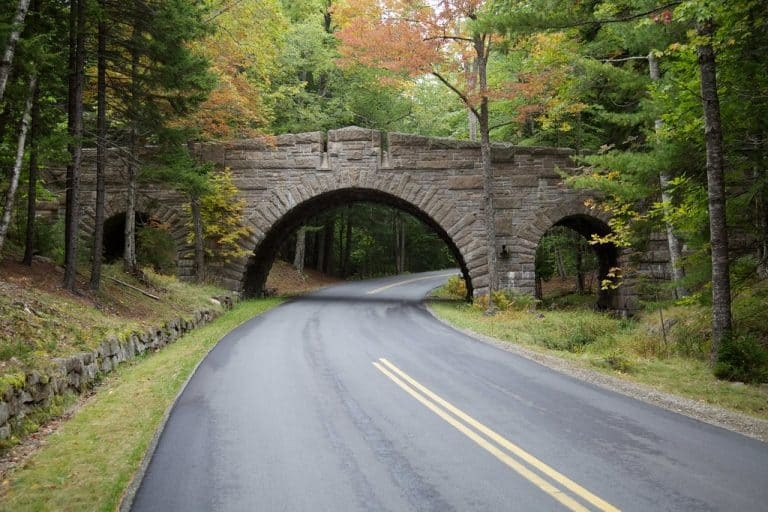 Acadia National Park’s historic carriage roads are most easily accessed near the Jordan Pond area of the park. The bridges are not only historic but also beautiful. These paths, designed by John D Rockefeller Jr for horse-drawn carriages, are now most easily explored by bike. However, be aware that the terrain is hilly and the paths are probably best enjoyed by older children and teens who are more easily able to get their bikes up and over the hills. While biking is most popular these days, there are still horse-drawn carriages that tour these roads; be sure to make advance reservations. There was a time when I knew the scientific names of all the algae in the tide pools of Acadia National Park thanks to my college ecology professor. While that trivia is long gone from my memory, I still enjoy scrambling across the rocky tide pools of Acadia lifting the algae in search of tiny creatures living underneath. The tidal range along the shores of Mount Desert Island is huge — which makes sense as it is very close to the Bay of Fundy, known for having the most extreme tides in the world. At low tide, a vast stretch of ocean floor is accessible and it is common to find crabs, sea stars, periwinkles, and even little fish in the pools left behind. 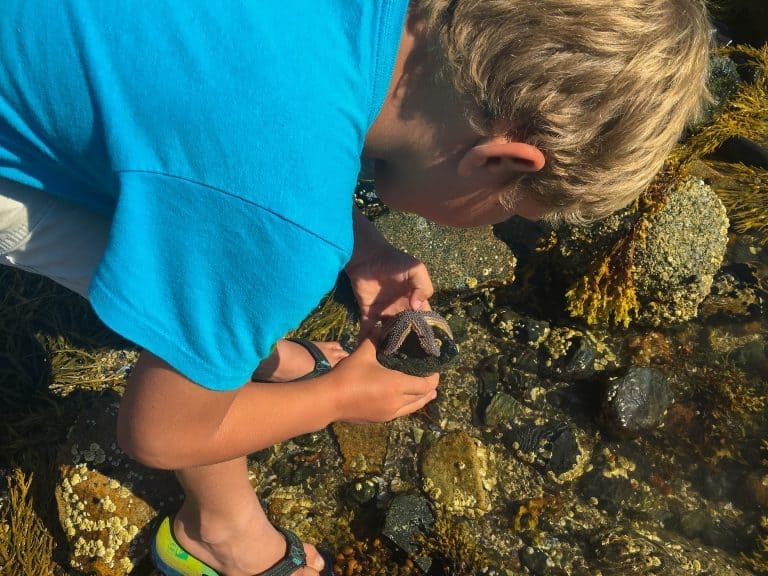 Generally, the southwestern side of Mount Desert Island has the most kid-friendly tide pools. National Park Service rangers recommend taking the Wonderland and Ship’s Harbor Trails out to the water; these both involve a short 15-20 minute hike through the forest out to the coast at low tide. Families will also find tide pools in the Seawall area where it is possible to park one’s car and walk directly out on the rocks. There are also tide pools by the Bass Harbor Lighthouse if you happen to visit at low tide; the rocks are steeper there so this is not the best area for little ones. Did you know that there is a part of Acadia National Park located on the mainland? No? You’re not alone! Most visitors spend their entire vacation on Mount Desert Island. Admittedly, we didn’t venture off the island on our last visit in August. 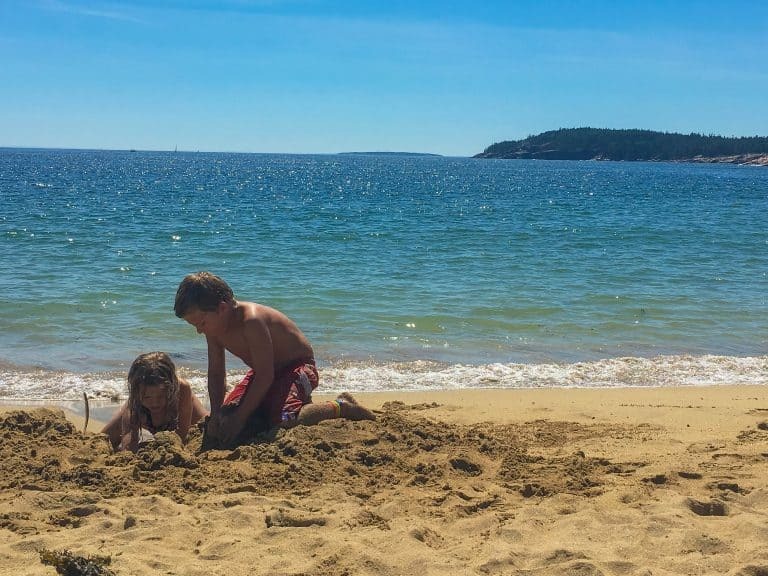 However, if your family tires of the summertime crowds, be sure to make the 45-minute drive from the island out to the Schoodic Peninsula to enjoy the quieter side of Acadia National Park. There is a scenic drive, more rocky cliffs, tide pools, and lots of places for older kids to scramble over the rocks and climb. I am personally not partial to the touristy crowds of the resort town of Bar Harbor. 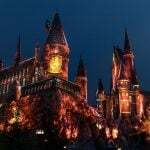 However, it does have a variety of places to eat and spend the night. Ultimately, Bar Harbor is a convenient place to stop for lunch or dinner when exploring Mount Desert Island. My family grabbed lunch one afternoon at Peekytoe Provisions in Bar Harbor after driving part of the Park Loop Road around Mount Desert Island. This casual Bar Harbor deli serves a variety of fresh seafood including lobster rolls, oysters, fish tacos, and scallops. 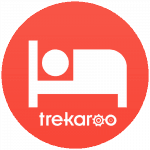 For more recommendations on places to eat and stay in Bar Harbor, check out my Trekaroo guide, Acadia National Park with Kids. If you’ve been on one of Acadia National Park’s hiking trails, you’ll be ready for a good meal. This is the land of fresh blueberry everything – from lemonade and soda to pies and muffins. There always seems to be a blueberry flavored beverage on the menu, and they never disappoint. It’s also possible to pick your own blueberries to eat along the trail! Of course, lobster is another must when in Maine. You won’t have trouble finding it on the menu across Mount Desert Island from Bar Harbor to Southwest Harbor. From lobster rolls to lobster macaroni and cheese, lobster lovers dine well on Mount Desert Island. I have visited Acadia National Park twice: once this past August during peak season with my children and my mother, and several years ago as part of a college marine ecology class in early May. I clearly remember the cold rainy days of traipsing about through tide pools in May rarely seeing another car along the Park Loop Road as we enjoyed Acadia National Park’s hiking trails. However, my pictures from this summer show a much different picture: sunny skies, warm temperatures, and Sand Beach full of sunbathers as early as 11AM. I’m sure that fall also offers an entirely different experience, likely with less crowds than the summer season but with better weather than early May. Families don’t have to visit in May to avoid the crowds at Acadia National Park; there are always areas of the park with fewer visitors. We drove over to Pretty Marsh at low tide, did some tide pooling on the not-so-pretty beach, and saw loads of marine life but only two other families. 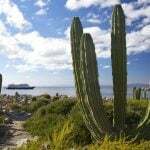 There’s a reason why crowds don’t flock to this part of the park; it’s simply not as scenic as the more popular places like Cadillac Mountain and some of Acadia National Park’s hiking trails. Due to the short summer season, families will rarely have Sand Beach or Cadillac Mountain to themselves. However, if you time to your visit early or late in the day to avoid the peak crowds, it’s not so bad. Purchase a pass at the Hulls Cove Visitor Center before entering the park. This is also the best place to pick up a Junior Ranger booklet and inquire about Acadia National Park hiking trails ranger talks and programs. The Junior Ranger booklet requires participation in a ranger-led activity. The touch tank program at the College of the Atlantic is a popular choice. Be sure to get there when the program begins. 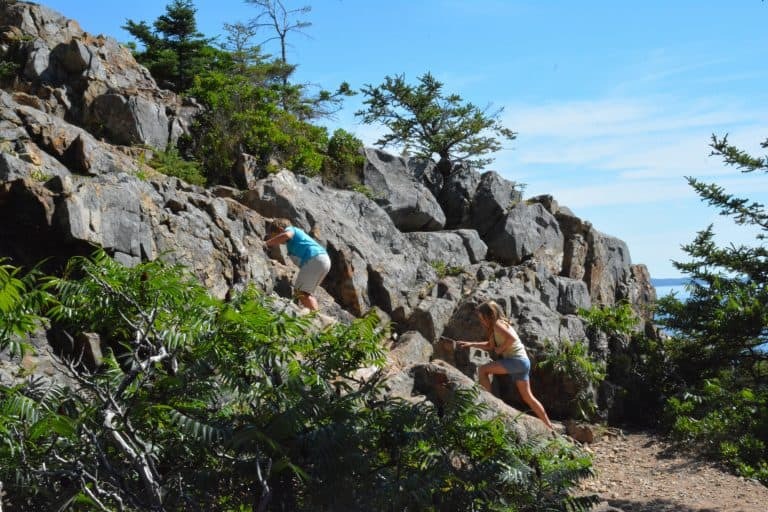 Most Acadia National Park hiking requires rock scrambling. They are most safely hiked in appropriate footwear. When I asked a National Park Service ranger for a short kid-friendly hike for our first morning in the park, he suggested the Great Head Trail. While my son loved all the rock scrambling on this Acadia National Park hiking trail, I wish that I hadn’t been wearing flip-flops. Sturdy rain boots might be the best footwear for checking out the tide pools in Acadia. It’s easy to slip, fall and cut yourself on the barnacles. Also, the salty ocean water is quite chilly. Be cautious as the tidal range is quite large, and the tide comes in quickly. My family included a visit to Acadia National Park, on a road trip to Eastern Canada. Read all the details of the Canadian portion of our trip: Epic Eastern Canada Road Trip with Kids. All photos are by Melissa Moore unless otherwise credited.